While mold is a naturally occurring fungus found in nature, it has no place growing within your home. Whenever you detect the presence of mold in places like the rafters, ceiling, or walls, make sure you get in touch with mold removal Catalina Foothills experts from 911 Restoration Tucson to lend you a hand with remediation. Mold can lead to significant structural harm because it can hasten the deterioration of wooden components. It also releases spores which can lead to adverse health conditions like coughing, skin irritation, headaches, or asthma. With all the risks that mold growth can present, a quick response is absolutely vital in order to secure your home. By calling the mold removal Catalina Foothills experts from 911 Restoration, we’ll make sure that the issue is addressed right away. When you call us, you can expect our team to be there within 45 minutes of your call! Structural deterioration – The foundation and the wooden sections of your home could start to deteriorate quicker because mold will feed off of these areas. Health Problems – Asthma, allergies, and skin irritation are among the health risks posed by mold spores being released in the mold infested section of your home. Reduces your home aesthetics – Those black or pink spots can be unsightly which reduces the overall aesthetic appeal of your interiors. Another problem is the moldy odor caused by fungal infestations. If you suspect your home in Catalina Foothills of being infested with any kind of fungus, our licensed, insured, and bonded mold removal Catalina Foothills experts will conduct a free visual inspection of your property so we can locate the source of the problem right away. Our IICRC certified mold removal Catalina Foothills technicians can perform the necessary water damage repairs to patch up those leaks and offer mold remediation. With those services, we’ll make sure moisture is removed and mold is taken care of. 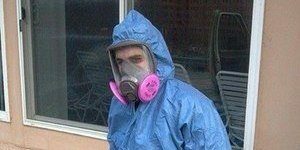 Our mold removal Catalina Foothills team will wear protective hazmat suits that will allow us to work on removing mold from your home safely Our eco-friendly cleaning solutions will be able to remove mold thoroughly from your home without causing any further damage to walls, carpets, or floors. We will be thorough in our approach so we’ll check crawlspaces, attics, and the spaces between walls to make sure all traces of mold are removed. Our remediation work will involve decontaminating your home of any fungal infestations. Once you notice any black or pink spots on the walls or ceiling, make sure you call 911 Restoration so we can take care of that mold problem before it can start spreading throughout your home. Whenever you’re in need of a fresh start to get rid of mold and water damage, you can trust that the mold removal Catalina Foothills technicians from 911 Restoration will be available 24/7/365 to lend you a hand. Give us a call today!